Tricks can be fun, but TREATS are way better. And this contest gives you a chance to win a ton of treats in the form of signed books, ebooks, candy, book swag and more from 13 authors!! We know…it’s kind of SPOOK-TACULAR! Visit each of the THIRTEEN participating author websites. You will find the name of the candy/treat they are giving away, as well as what BOOK they are offering as part of the PRIZE PACK! Be sure to write down the name of the treat, you’ll need it later. 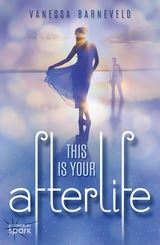 I’m giving away a Kindle e-copy of my ghost book, THIS IS YOUR AFTERLIFE, plus Reese’s Peanut Butter Cups. When you have collected the names of all 13 author “TREATS”, head on over to complete the Trick or Treat Hunt Page Google Forms doc HERE and enter the correct treat next to the corresponding author name. PARTICIPATING AUTHORS and their AWESOME BOOKS! To continue the blog hop, click on lovely Jodie Andrefski‘s book cover below. Good luck! So much fun! Happy Halloween! I love Reese’s! Hi, can you follow my blog? Thank you.